Since my last posting, “Trust”, I, along with five other early childhood educators, had the opportunity to meet with the Deputy Chancellor of the New York City Department of Education, Shael Polakow-Suransky. We found the meeting to be quite productive. We’ve been invited to return for a second meeting in a few weeks. I’m feeling positive and hopeful. More to come after our next meeting! 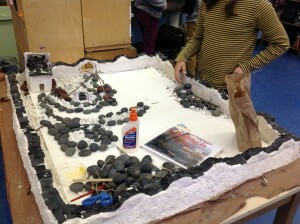 This entry was posted in Investigating Choice Time: Inquiry, Exploration, and Play on February 20, 2013 by Renee. Can trust exist in today’s tense educational climate, when teachers and administrators rightfully feel as though someone is always looking over their shoulders? Yes! Trust does exist in classrooms where teachers have the confidence and administrative support needed to follow their understanding of what children need rather than the proscriptions of a teaching program or pacing calendar. 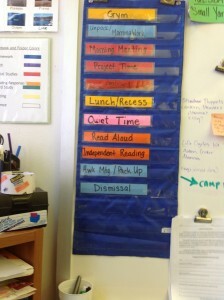 For an example of a teacher’s trust in children, let’s enter Marta Quinones’ first grade classroom at P.S. 142. The children are studying subways. They’ve gone on underground and over ground rides, interviewed workers, and attended a talk given by Paul Steely White, the director of Transportation Alternatives. Because of their particular interests and the involvement of the school art teacher, they visited various stations to see the displays of subway art. 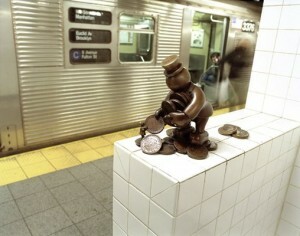 There are plans for the children to visit Tom Otterness, the sculptor who created a wonderfully whimsical piece that is on the platform of the 14th street A train station. They’ve read nonfiction and fiction books about subways and written stories and fact sheets about turnstiles, vending machines, motormen and Metrocards. 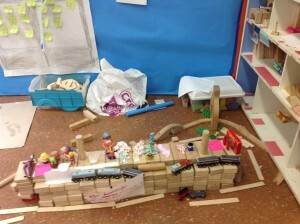 Subway stations are being built with blocks, Legos, and all kinds of recycled materials. 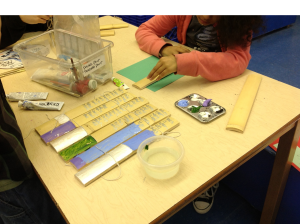 Two girls preparing to turn a large cardboard box into a Metrocard machine are discussing how the inner mechanisms might look and work before beginning on their construction. In one corner of the classroom, near the sink, a group of children are clustered around a table covered with bowls, flour, salt, yellow paint, and various measuring and mixing spoons, Three of the children are reading aloud from a recipe chart as one child slowly pours a cup of water into the bowl. I sat down and asked them why they were making their playdough yellow. The water pourer looked up and told me, “We’re making a subway station and the tracks are with yellow playdough. We need to make more playdough so we can finish the tracks.” “Next we’re going to make the platform and then a subway train,” piped in the girl holding the recipe chart. They pointed to a nearby table that held a large piece of cardboard with subway tracks made from yellow playdough weaving around the perimeter. Where was the teacher? Why wasn’t Marta sitting with them? This Thursday, five kindergarten teachers and I are going to the former Tweed Courthouse, now home of the New York City Department of Education for a meeting with the chief academic officer of the New York City public schools. We want to give voice to the many kindergarten teachers who are being silenced by, what some have described to me as, an insidiously oppressive atmosphere of intimidation in the schools. There seems to be a fairly widespread belief that it’s safer to be quiet and not complain rather than taking the risk of speaking up and possibly losing a job. We want to give voice to the many children who are missing out on an important kindergarten year because a developmentally ill-suited curriculum is imposed on them. It’s not uncommon to hear it said that kindergarten is the new first grade. Among the six of us, we calculated that we have a hundred and fifty cumulative years of experience teaching the early childhood grades. Our meeting was prompted by our professional discomfit with the present direction of early childhood education in New York City public schools, most specifically in kindergarten. An ever-increasing number of assessments are filling up the day. Kindergarteners are often given “busy work” so that their teacher can sit with one child to administer an assessment, often one that has no practical use in classroom instruction. “Performance tasks” that do not, in any way, relate to most five-year olds “zone of proximal development” are imposed by bureaucrats who have little or no experience with children of this age and little obvious knowledge of child development. Even though the common core-aligned task for kindergarten English Language Arts described on the DOE website states that children should “use a combination of drawing, dictating, and writing to compose informative/explanatory texts in which they name what they are writing about and supply some information about the topic” many administrators (perhaps in response to outside pressures) are insisting that teachers must not take any dictation. Five year olds are, in many schools, expected to do their own writing in this task. This might be possible for some children, but for many these become stressful, frustrating and humiliating experiences. Our visit is a response to an email that I sent to the Deputy Superintendent a few months ago. I had just received a note from a depressed and frustrated kindergarten teacher who was bemoaning the way that her day was co-opted by a variety of administratively assigned assessments, Teachers College lessons and pacing calendars and hours of clerical record-keeping. All of this, she wrote, was preventing her from providing her students, mostly English Language Learners, with the kindergarten experiences that they so desperately needed. I was so upset by this note. In the heat of the moment, after reading and rereading it, I decided to pass it on (without the teacher’s name) to the deputy superintendent, challenging him to respond to this sad message. To his credit, he very shortly afterwards responded, inviting us to come and speak with him. I asked if we could include a few other teachers and this was approved. A representative from the deputy chancellor’s office has emailed me several times to confirm the details for this meeting. She made it clear, on more than one occasion that we will only be allowed thirty minutes to present our thoughts. Thirty minutes! Does the Deputy Superintendent not trust us to share the sincerity and wisdom of our experience with him? We want to explain to him our belief that kindergarten is a year for building a strong foundation, which will support the academic learning for the years ahead. If we can speak fast enough, we would like to say that in kindergarten the child should develop a sense of himself/herself as a learner. There should be experiences that strengthen the child’s sense of curiosity, exploration and self-regulation. The child should be feeling secure enough to take risks without the fear of failure. The teacher of five-year olds should intentionally be providing rich first-hand experiences that are connected with children’s interests, opening up many opportunities for talk, questioning, creating, and experimenting. Kindergarten children need time to engage in unstructured outdoor play. When children’s free play occurs under the watchful eye of the teacher, there are many opportunities that present themselves for scaffolding conflict resolution strategies, so necessary for all aspects of life. I’m hoping that the deputy chancellor will understand the reality of a kindergarten child’s school day in NYC – highly-structured programs that are heavy in academic instruction, lack of time to learn through exploratory activities, and in many schools, no opportunities for children to play outdoors other than a few minutes at lunchtime. This does not match up with what we know is best for developing self-motivated and confident life-long learners. I am putting a lot of trust in the sensitivity, respect and interest of the deputy superintendent. I’m trusting that he will understand that this discussion is all about the children. I’m trusting that this visit will be the start of a long and serious conversation that will, ultimately, have a positive impact on the lives of the kindergarten children in the New York City public schools. 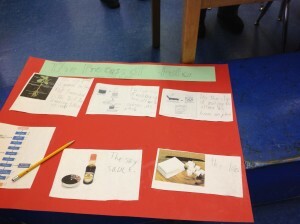 This entry was posted in Investigating Choice Time: Inquiry, Exploration, and Play and tagged ELA, Paul Steely White, Transportaion Alternatives, trust on February 12, 2013 by Renee. Trust. Belief in children. Community. These are that buzzwords that have imprinted themselves in my thoughts since my last visit to the preschools and new elementary school in Reggio Emilia. Coming home, after my inspiring trip, was like crashing back to earth from a wonderful float in space. Common Core Standards. Rubrics. Performance tasks. Bundles. High- Stakes Tests. Assessment. All of these words have become the jargon bantered about by politicians and the educational bureaucracy. They do not represent instruction based on teachers’ observations and assessments of the children in their classes. Education today is functioning like a body minus a heartbeat. However, last Thursday, I walked into Steve Wilson’s third grade classroom at The Brooklyn New School, and I finally heard the thumping of a heartbeat. This time it was my excited heart beating with enthusiasm as I saw that those Reggio buzzwords are alive and well again…trust – belief in children – community. Steve’s class has spent the last few months intensely studying China and the children were getting ready for their China Museum day that would take place next week. The room, a large space for a New York City public school classroom, was filled with traces of the various explorations on the topic. High up on the front wall hung a huge red kimono. Posters with photos from trips and projects were inside and outside the room. 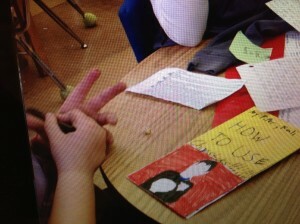 Mainly, though, children were working in groups on a myriad of projects. On the wall was a chart stating the project rules…Everybody helps. We help each other do things for ourselves. We explain by telling how. How right he was. The children were eager to explain all about the history and use of the Oracle Bone. 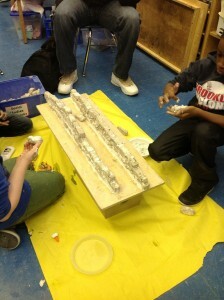 They were getting this bone ready to be inscribed with important questions that they would pose. 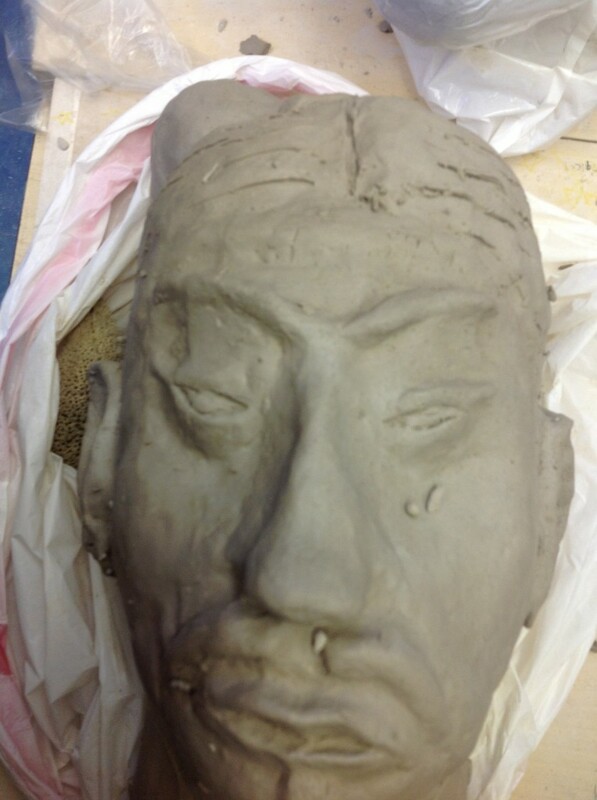 Last year, in anticipation of their next year’s China study, the second grade teachers took their classes to see the exhibition of the Terracotta Warriors from China. This year Steve gave children opportunities to build on that experience in class discussions and individual research. 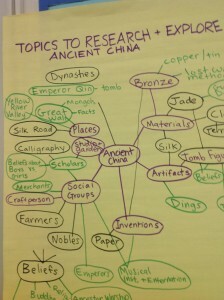 Hearing the Mary Pope Osborne book Day of the Dragon King read aloud gave the children many ideas for topics to research. 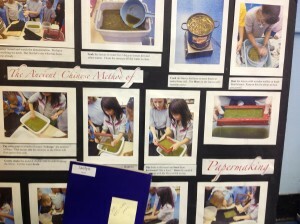 They raised silkworms in class and the day that I visited, a group of children were using beet juice to dye the silk. 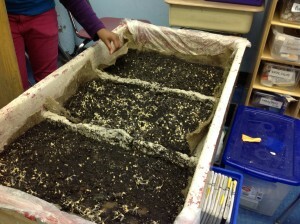 Another group showed me how the “rice paddy” that they planted was finally germinating. A small group of children were painting a story onto bamboo sticks while another group sat on the floor constructing the Great Wall of China. Mirrors and stones were used to recreate the Chinese Scholar’s Garden that the class visited at Snug Harbor in Staten Island. A boy who had been working in the hallway outside the classroom, brought his black and gray ink brush painting inside to share with Steve. Looking at it thoughtfully, Steve asked him to talk some about what he was aiming for in his image. After taking a minute to think about it, Steve explained how the blacks in the image could be used against the grays to give a greater sense of depth. He suggested giving it another try. 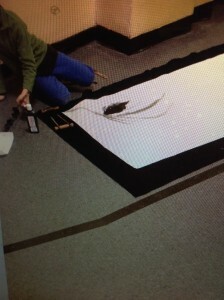 Without any hesitation the young artist, who had been listening seriously to Steve’s suggestion, took another large sheet of paper, returned to his spot in the hallway, and began to work on his next painting. Because there was so much work to get ready for the China celebration, adjustments were made to the usual daily schedule. Project Time began at 9:20 in the morning and children were working until 11:20 a.m.. 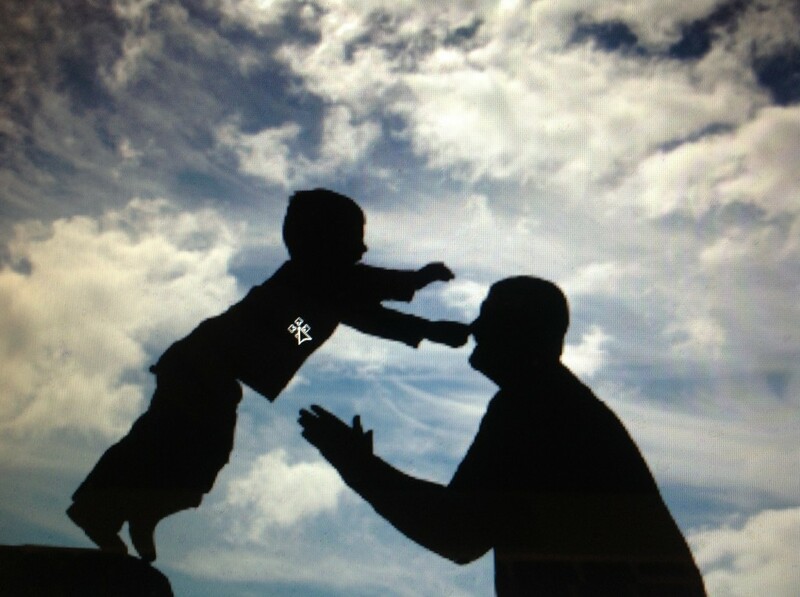 Sometime in the middle of the work time, Steve gave the signal for children to pause in their work. 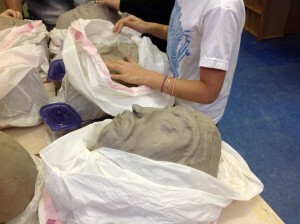 They were softly asked to take a deep breath, and were reminded to stay focused on their group’s project. At 11, it was time to clean up. Steve very softly announced, “Clean up is not separate from Project Time. It’s the last part of Project Time and needs to be taken just as seriously. If you finish cleaning up your center, don’t forget to see who else needs help” With thirty-one third graders sweeping, washing, organizing materials, moving projects to storage space, picking up pencils, washing brushes, it was quite a scene! Eventually, the room was clean, children were grabbing coats and lunchboxes and somehow they all made it out of the room in time for their 11:20 lunchtime! What is it that allowed Steve to have so much trust in his children’s ability to work independently on those in-depth projects? How could he have so much belief in their potential to learn through these explorations? Steve generously gave up his lunch period so that he could meet with me to discuss the multitude of questions swirling about in my mind. First of all, he explained, he has the luxury of working in a school where children learn through inquiry and exploration starting in pre-kindergarten and going up through each grade. This is not new to them when they enter his class in September. During the first part of the year, Steve told me, he focuses on building a strong and respectful classroom community. Later, when he began the China study, they worked on whole-class projects like making lanterns and raising silkworms. This supported an understanding of how to follow through on a project from the early stages, through the middle and to the culmination, thus allowing children to ultimately work in small groups without his close supervision. What stood out to me was Steve’s confidence in the children. He gave himself permission to take the time to do what he knew was needed to support his work. As I heard in all three trips that I took to Reggio Emilia, Steve used a road map for his instruction rather than a train schedule telling him when to start and stop. After our meeting, I went downstairs and ran into Anna Allanbrook, the school principal. I asked her if she could spare a few minutes to answer some of my questions. My main question to Anna was, “What do you do about the Common Core, Performance Tasks, and all of the mandates that are coming down from the city, the state and the national Department of Education.? Anna chuckled. She seemed to be anticipating this question. Perhaps it is something that she is often asked. Anna pointed out to me that all of the inquiry work being done throughout the school fits so well into the intention of the common core standards. In fact, Brooklyn New School has had an emphasis on reading nonfiction texts for years because of how important they are in the inquiry research. She also explained that the staff has plans to meet at the end of the school year to codify their various inquiry projects, showing where and how they align with the common core standards. As part of their project work, the children are doing a lot of authentic, intentional writing. They’re asking questions, analyzing data, responding to information in many using a wide variety of modalities, collaborating and problem solving. What more can we ask of our 8-year olds? After speaking with Anna, I stopped by Steve’s classroom to say goodbye and thank him for a wonderful morning. It was independent reading time. There was a hush in the air as children, scattered around the room, were quietly engaged with their individual books. Sitting on a bench at the side of the room, Steve was head to head conferring with a boy. I looked at the chart that hung on the wall over their heads and read these words . “Talent is what you have. 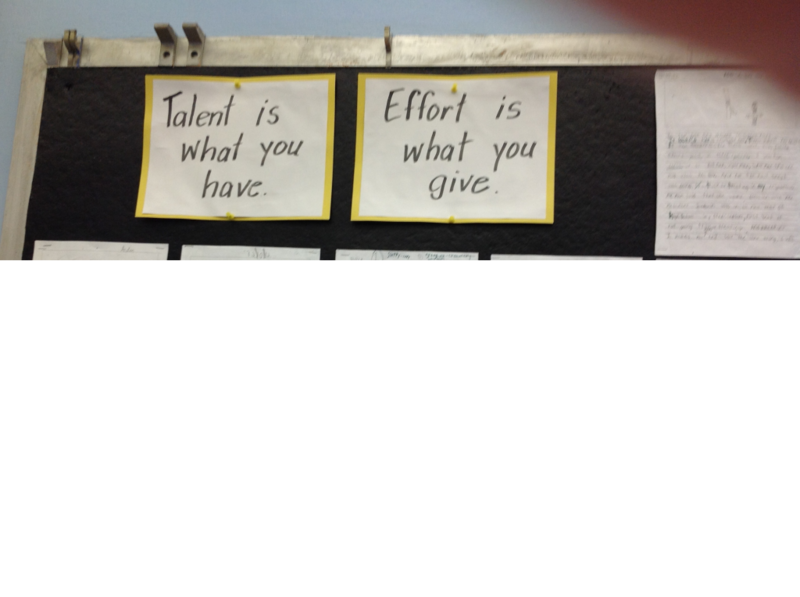 Effort is what you give.” These few words say so much about the spirit of this classroom . We all have our own special talents and we also all have a commitment to giving something to our community. 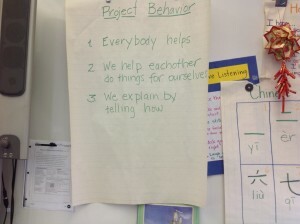 This entry was posted in Investigating Choice Time: Inquiry, Exploration, and Play and tagged belief, bundles, community, Day of the Dragon King, faith in children, Mary Pope Osborne, Oracle Bone, performance tasks, research, Terracotta Warriors. Chinese Scholars Garden on February 4, 2013 by Renee.